This is the ultimate in die cut tape. Real Pro's uses the highest quality prism tape then custom cuts it to fit the dome on our French spinner blades. All Real Pro's die cut prism tape have water proof adhesive for trouble-free use. Start customizing Your lures. 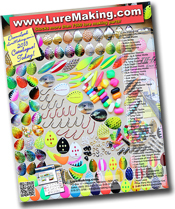 These Die cuts are for permanent placement on Your lure. Sold by the dozen (12's).